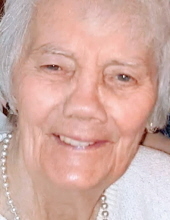 Margaret M. “Margie” Gibbons, passed away on April 4, 2019. Margie lived an exemplary life, dedicated to serving the Lord. She devoted many years to serving others as a registered nurse in several nursing fields, and was on the faculty of St. John College. She was a member of St. Malachi’s Parish, volunteering there for many years. She was born in 1933 in Cleveland, daughter of Patrick and Mildred (née Kraus) Gibbons. Margie was preceded in death by beloved brothers Patrick, Richard, James, and Thomas; sisters-in-law Marie, Esther, and Setsuko; brother-in-law Edward Karath; and cousin Mary Anne Lucas. She leaves to cherish her memory her sister, Jeanne Karath, brothers John Gibbons and Ralph Gibbons, sister-in-law, Janis Gibbons, and many nieces and nephews. Margie’s deep commitment to family helped the branches of the Gibbons family to stay connected, and she also greatly enjoyed being the “adopted aunt” to the children of lifelong friends and former classmates Mercita FitzGerald (Arthur) and Joan Riess (George). Margie’s family would like to extend special thanks to Michael Kenny for his steadfast care and wise counsel, the staff of St. Augustine Health Ministries, and her faithful friends who loved her. Visitation will be at 10 AM, April 13, 2019 at St. Malachi’s Parish, 2459 Washington Ave., Cleveland, OH 44113, followed by a funeral mass at 11 AM. The burial service will be private. In lieu of flowers, donations may be sent to Malachi House, P.O. Box 932058, Cleveland, OH 44193, or to the Little Brothers and Sisters of the Eucharist, 3675 W. 165th St., Cleveland, OH 44111. Arrangements by McGorray-Hanna Funeral Home of Lakewood. "Email Address" would like to share the life celebration of MARGARET M. GIBBONS. Click on the "link" to go to share a favorite memory or leave a condolence message for the family.